The DNA profile of a animal is also known as a genetic fingerprint. Compared to other marking methods as microchips or tattoos a DNA profile can neither be manipulated nor destroyed (e.g. by injury). It remains constant during the whole life of the animal, and even after its death. 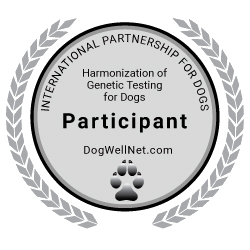 On one hand the DNA profile offers a doubtless identification and on the other hand it is the base for parentage testing and also a part of breed determination. 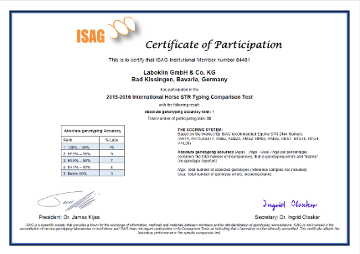 Laboklin (Labogen) generates the DNA profiles according the recommendations of the „International Society for Animal Genetics (ISAG)" (ISAG 2006 standard). The DNA profiles established according this international nomenclature are international comparable. For quality assurance i.a. 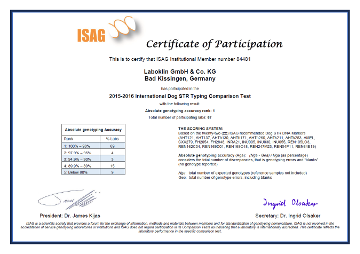 there are comparison tests organized through ISAG. Laboklin participates constantly with exellent results.